The Great ShakeOut is an earthquake safety drill to help people practice earthquake safety and preparedness at home, work or school. This annual event started in 2008 as the Great Southern California ShakeOut and has expanded to over 20 U.S. states and countries including Canada, Italy, Japan and New Zealand. In most areas, the ShakeOut is held on the third Thursday of October. So this year, at 10:18 a.m. on October 18th, people were asked to drop, cover and hold on as if a real earthquake occurred. 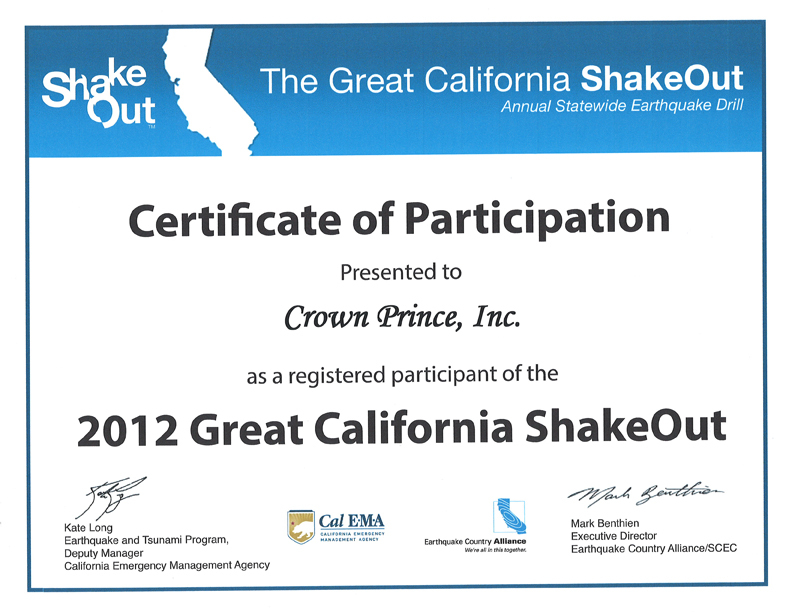 Crown Prince Seafood along with 19.4 million people worldwide participated in this annual drill. Earthquakes can strike without warning, day or night, and may cause property damage, injuries and deaths. Practice and preparation can significantly reduce injuries. Read these Emergency Preparedness Tips to learn what to do before, during and after an earthquake strikes.